The team at Yorkshire’s first malt whisky distillery has launched the third of its distillery projects ahead of the first bottling of its premium single malt whisky in 2019. 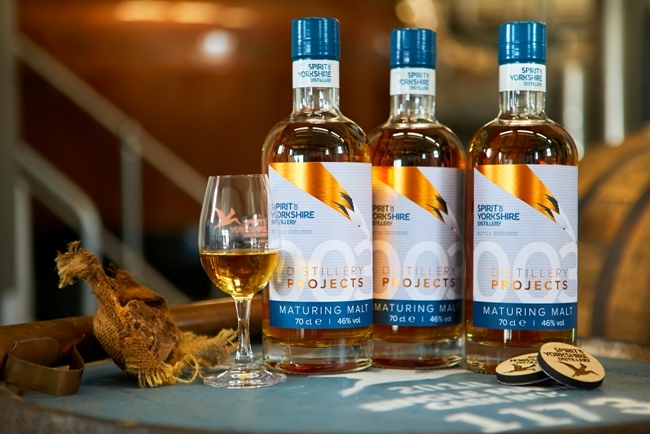 Sprit of Yorkshire’s Distillery Projects 003 is a limited edition Maturing Malt and offers a taste of the maturing casks at the Hunmanby, North Yorkshire, distillery. The third of a series of four collectible spirits, DP003 is described as being “soft, creamy and sweet, with notes of milk chocolate, stoned fruits, banana split, pink wafer biscuits and orange zest”. Spirit of Yorkshire Whisky director Joe Clark said: “The Distillery Projects series evolved from positive feedback to samples of the maturing malt that visitors enjoyed when touring the distillery. “Originally, I wanted to focus on our Bourbon cask matured spirit for DP003, but after discovering an incredible PX Sherry cask filled in November 2016, the release moved in a different direction. It was just too good not to involve in this expression and, when balanced out against both our Bourbon and Red Wine matured spirit, the results were stunning. Launched at the distillery’s first Open Day on August 11, Distillery Projects 003, 46 per cent ABV, is limited to 2000 individually numbered 70cl bottles. The pair have invested significantly to follow their dream of creating a Yorkshire whisky that doesn’t simply replicate Scotch. The distillery is a true field to bottle setup and boasts some of the most impressive distilling equipment in the country, including two of the largest Forsyth pot stills operating in the UK outside of Scotland. In addition to distilling whisky and conducting guided tours, Spirit of Yorkshire is home to the Pot Still Coffee Shop that serves a variety of home cooked food and hosts regular events including monthly Distillery Sessions and special events. Forthcoming events include Distillery Sessions with Carrie Martin on August 31 and a “Pot Still Pop Up”‘ whisky-inspired three course meal from Birds on the Loose on October 11.